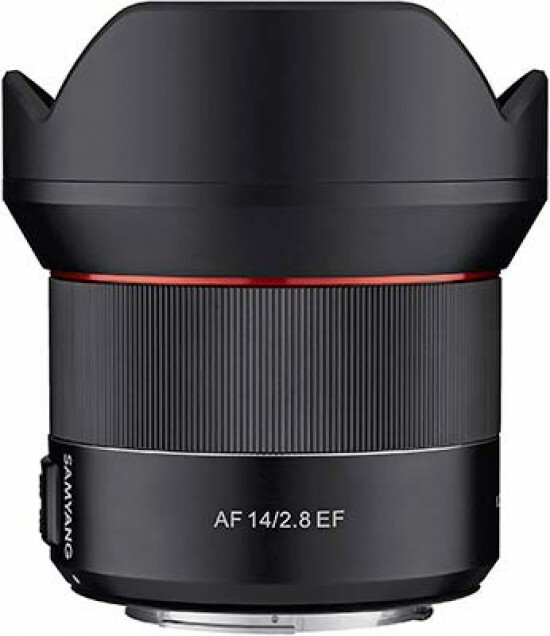 The new Samyang AF 14mm f/2.8 EF is a very affordable, yet still high-quality, ultra-wide-angle lens for Canon full-frame DSLR cameras, and also APS-C models where the effective focal length is 21mm. It's also the first ever auto-focus lens from Samyang for Canon full-frame DSLRs, following the release of several AF lenses for Sony's Alpha full-frame camera system. In terms of image quality, sharpness is good when shooting wide-open at f/2.8, becoming even better from f/4 onwards, but the edges aren't quite as sharp as the centre, with f/8-f/16 producing the sharpest results. There's obvious vignetting at wide-open apertures, admittedly something that other ultra-wide-angle lenses also suffer from, but chromatic aberrations are well controlled. The weather-proof build quality is excellent, with the metal lens mount and housing adding to the high-quality feel. Samyang have also included a very good petal-shaped lens hood to both protect the bulbous front element and prevent flare, although it is non-removable which prevents the use of filters with this lens. Auto-focusing was acceptably quick and also quiet on the Canon EOS 5DS R camera that we tested the lens with, although we missed having manual focus over-ride at any time. The price of the Samyang AF 14mm f/2.8 EF is undoubtedly very attractive given the fast f/2.8 aperture, complex construction, quick and quiet auto-focusing, and the sheer cost of its main rival, the Canon EF 14mm f/2.8L II USM, which officially retails at 3.5x the price of the Samyang lens. All of this combines to make the Samyang AF 14mm f/2.8 EF lens a worthy winner of our Highly Recommended award.